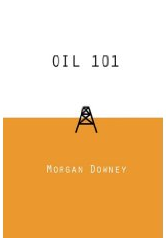 Oil 101, by Morgan Downey, is without a doubt the most detailed and comprehensive book I have ever read on the oil industry. In fact, I am not aware that another book like this even exists. This is not an opinion piece, nor is it a peak oil book. It is a collection of factual information covering all aspects of the industry. From oil in the ground to product in the tanks (and everything in between) – this book contains everything you could ever want to know about the industry. I like to think I know quite a bit about different areas of the industry, but I still managed to learn a lot from this book. It doesn’t matter if you are a complete novice or already know quite a bit about the industry; there is something for everyone in this book. Downey displays a deep understanding across all sectors of the industry. For instance, if I didn’t know better I would have guessed that the refining chapter was written by someone who had spent an entire career in the refining industry. The only books on refining that I have read that were more comprehensive were those written specifically as technical guides for running a refinery. Other areas are covered in similar detail. There is no aspect of the industry left uncovered. The book starts with a brief history of oil, and then dives into fundamentals like assays, chemistry, exploration and production, refining, transport, storage, and reserves. There is a separate section on the oil markets that really gets into layers of the onion that I didn’t even know existed. One thing this section did for me was disabuse me of any notion that I ever want to trade oil futures (unless of course I have someone like Morgan Downey advising me). There are 500,000 producing oil wells in the U.S., 80% of which produce 10 bpd or less. Still, this accounts for 20% of U.S. production. There are 1600 retail stations selling compressed natural gas (CNG) in the U.S., which is in the same range as the number of stations selling E85. 20% of new transit buses in the U.S. run on CNG. Valero, the largest U.S. refiner, is not a member of the API. One of the things that surprised me is that I didn’t spot more factual errors in the book. After all, this book is primarily a collection of a great many facts. With so many facts listed, I expected to find quite a few errors. I did not, although I did find a couple. On page 194, Downey writes that the RVP of ethanol is 19 psi and is much more volatile than conventional gasoline. Actually, the RVP of ethanol is 2.3 psi. However, when blended with gasoline, ethanol behaves as if it had a much higher RVP. The reason for this is that ethanol is slightly polar, and doesn’t mix ideally with nonpolar gasoline. This means that ethanol does raise the RVP of gasoline when it is blended, contrary to what would be expected for a nonpolar blending component with a 2.3 psi RVP. So one could argue that when you are doing blending calculations the “effective RVP” of ethanol in gasoline is much higher than gasoline – but the true RVP is quite a bit lower. In that same section Downey shows a table (Table 9-10) that states that the nationwide RVP for winter gasoline is 11.5 psi. However, in places where winter temperatures are quite cold, the allowed winter RVP is as high as 15 psi. (Since atmospheric pressure is about 14.7 psi, that means that your winter gasoline can boil if kept until summer). I covered some of these issues in Refining 101: Winter Gasoline. There are a couple of other items to note. First, the book is not referenced, which meant I was often left wondering about the source of a specific fact. (Presently, this involves me e-mailing Morgan and asking for a source). Second, while the book is almost exclusively just factual information, there were a couple of occasions in which Downey injected his opinion. One instance occurs on page 277, where he is discussing oil shale, and writes that it is “a clear net waste of energy.” Another case occurs on page 317 where he writes “the so called hydrogen economy is mere hype…” While I happen to agree with him on both counts (at least the way things presently stand), these were instances where he departed from the agnostic style employed throughout the rest of the book. Last month David Henson, President of Choren USA, came to visit me in Dallas and I happened to have the book sitting on my kitchen table. David picked it up several times, and finally said in his charming Australian accent “This is really great stuff! I have to pick up a copy.” I told him that I hadn’t read it yet, but in the three weeks since then I managed to finish it (I read when I fly, and over the 3 weeks I have flown a lot). To this date I have never known of David to be wrong on an issue pertaining to energy, and found his assessment of the book to be spot on as usual. To conclude, if you want to understand the oil industry, Oil 101 will tell you what you need to know. In fact, “Oil 101″ will be my stock answer from now on for anyone who wants to learn more – whether you know nothing or already feel like you are well-informed. Likewise if you want a very good reference book that deals with even the most esoteric information (e.g., like the differences in various grades of asphalt, or the differences between hydraulic fracturing and thermal recovery). In fact, I would even strongly recommend the book to anyone who had just gone to work for the oil industry and wanted a detailed understanding of how the entire oil supply chain works.